CTO: What in the @#$^& is that? The CTO is the person who wakes up every single day obsessed with making sure roles are filled with rockstars and that you’ve got an ample supply of people, both internally and externally, at the ready for future needs. Put another way, they’re obsessed with recruiting, hiring, developing and retaining the people you need to get the results you want. Working with the CEO/ED and senior management team, the CTO sets a strategic vision and priorities for all talent work, ensuring you’ve got an eye on what you’ll need in the coming 3-5 years, including an explicit equity lens, and what it will take to get there. Here’s an overview of the CTO’s six likely main areas of focus. Note that these are overlapping and the CTO’s focus/amount of time spent on each area will be different depending on your context. In some organizations, the CTO might manage a small team focused on all talent-related activities (including managing HR systems and processes). Hiring – Filling current open positions. For many organizations, especially those experiencing reasonably high growth and/or have high turnover, this may be the CTO’s #1 priority. They increase the success rate of new, diverse hires and decrease the time and energy it takes to find them by continuously building pools of outstanding candidates, developing programs to test the capabilities of prospective candidates, and driving focused, efficient hiring processes that assess the right things. Hiring – Building a proactive pipeline/pool for future positions. We point this out as a separate area since we find most organizations ignore the critical step of continuous pool-building. This helps you cut down cycle time for filling open positions, gives managers confidence to take action on underperforming staff, and ensures that the candidate pool for every role is diverse. Otherwise, faced with an urgent need, hiring managers will tend to pull in candidates from their own networks to find candidates and end up with a non-diverse shortlist. Proactive pool-building is also critical for organizations that have episodic hiring needs (eg., large number of canvassers needed in a month for a six month period). Many CTOs develop or draw from internships or volunteer programs for pool-building. New staff on-boarding: New staff on-boarding takes a village; the CTO is responsible for setting up the framework and processes to ensure every new staff member has a high-quality on-boarding experience. This could include creating/updating on-boarding materials and checking to make sure managers are following the on-boarding guidelines with every new hire. Learning management and talent development: While most organizations have, at a minimum, informal systems in place for on-boarding new staff, learning management is mostly ad hoc. Working with individual managers, the CTO ensures smart development plans are in place for all employees, focused on both immediate and longer-term organizational needs. A critical role the CTO plays is in making sure the plans are actually carried out—by tracking, nudging and making it easy for managers to help connect their staff with learning opportunities. These could run the gamut from technical skill training to rotations to stretch assignments. Oversight of performance management systems: The CTO oversees performance evaluations and makes sure that promotion and compensation discussions are done consistently and incorporates an equity and inclusion lens. They may lead projects such as updating performance evaluation templates, creating a rotation program for high performers, or creating career pathways for specific roles. Another hands-on role for the CTO is to act as a thought partner for managers on staff issues—be it a performance challenge or a retention issue for a high-performer. The CTO is to your people what your Development Director is to your fundraising—responsible for increasing a sustainable supply of an incredibly precious resource. 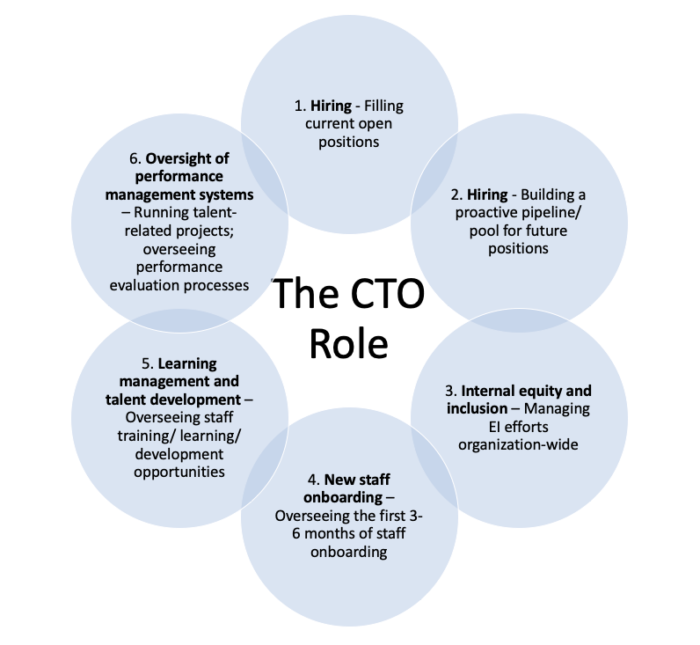 If you think your Head of Hiring is the right CTO candidate, you could start by layering on some of the non-hiring aspects of the CTO job to their role and help them grow into the CTO role.